Have you ever tried light painting? This is a fun experiment particularly in this digital age. It use to be of course we had to wait for film processing to see our results. Now a days, we have the benefit of instant feedback. This exposure was taken about 30 minutes after sundown. The shutter speed was 45 seconds long at a unrecorded f-stop perhaps f8.0. During this exposure, I walked into the frame carrying a 1 million candle power flashlight. 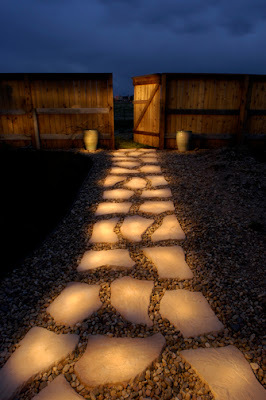 I lit each of the stepping stone just for an instant as I walked up the gate. While still moving around, being careful not to stand in any one spot for to long. Remember, the shutter is open for 45 seconds, I never stand long enough to be recorded. While out at the gate, I washed the fence and gate with light. I hit each of the pots on the sides of the gate. When light painting like this, I try to imagine the complete image in my minds eye as I paint. Staying focused on what your doing, will allow you the ability to chance your settings and timing (duration of illumination) in subsequent exposures. Quite honestly, it only took about 10 tries to get the results shown here. I point this out because I want to stress to you, the importance of visualizing your image and staying focused. It's not that different than visualizing the effects of dodging and burning a darkroom print. This is very cool. I have been having a discussion about this very technique with another photographer recently. I love the results you got here. Thanks for sharing. This photo is also on a facebook page for some multi-market thing. It's also being used on some facebook page for a multi-level marketing thing.